Now I have this thing I guess I better check it works. Luckily it had pin out on the side and the data sheet was easily found on the internet so setting it up was pretty straight forward. 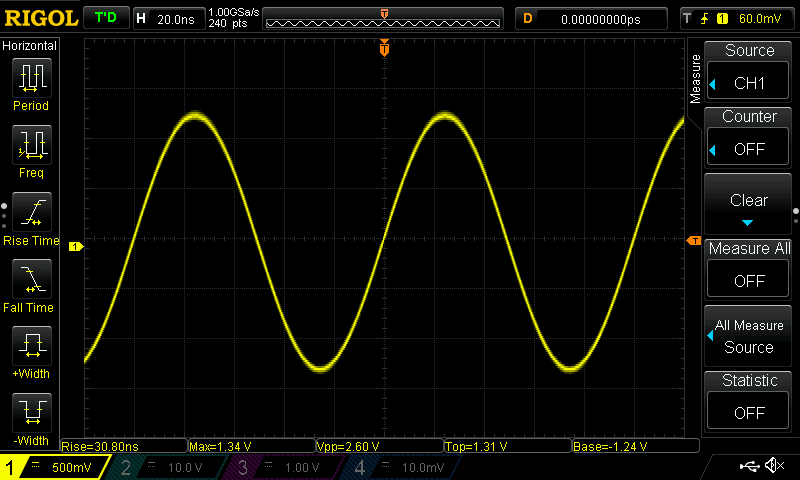 According to the data sheet it needed a supply of between +19v and +32v (+24Vdc nominal) capable of 1.7Amps. For the test I used my bench supply, the positive connects to pin ten and the return to pin eight. You also need a way of knowing when the standard has locked, this done by measuring the voltage of pin 6, I opted for a multimeter but you could just as easily used another channel on your scope. Finally you need a method of measuring the out put, I used my TTi TF830 frequency counter and my Rigol DS1054Z Oscilloscope. These were connected to pin 1. 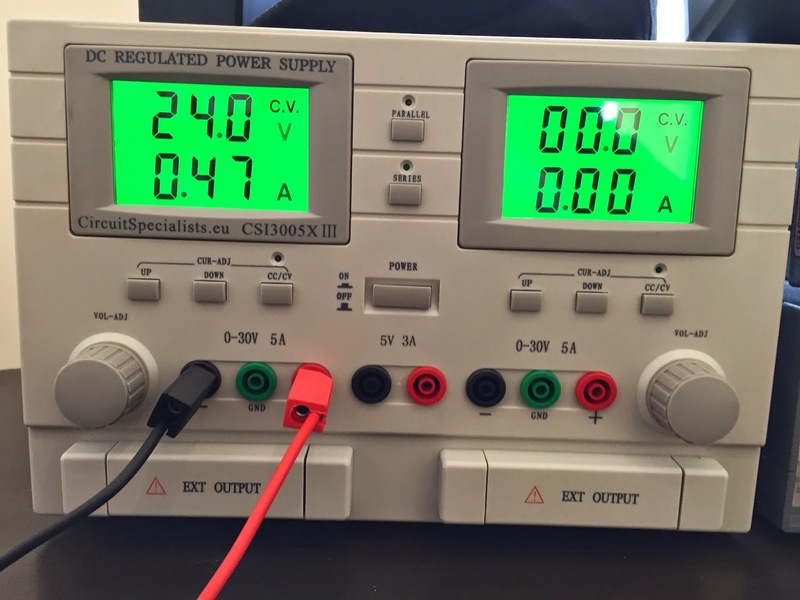 So time for the moment of truth, I powered up the standard, and it drew about 1.5 Amps for the first two or three minutes then it dropped down to 0.47 Amps once it had reached temperature. A few moments later the voltage on the lock pin (its labeled BITE on the pin out) dropped from 4.7V to just above 0V indicating it had locked. 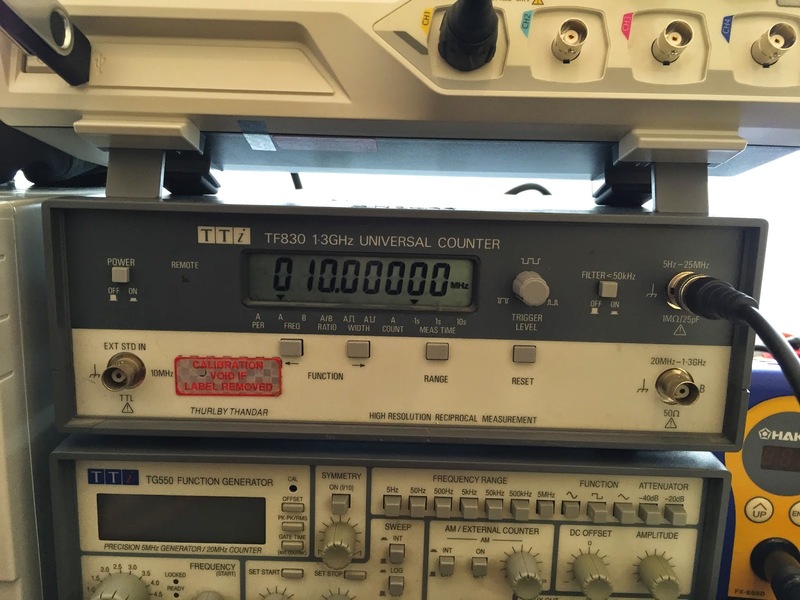 During it reaching lock the the counter had been varying its readout by a few tens of hertz once it reach lock it kept flipping between 9.9999999 and 10Mhz. After a further ten minutes it displayed 10Mhz continually. I am inclined to believe that this final 1hz variance was down to the counter having not yet reached temperature as it had only just been switched on rather than any change in the output of the standard. It is also worth noting that neither the scope or my counter have an oscillator any ware near as consistent at the standard so I am taking there readings with a pinch of salt although things look good. All in all I think its safe to say the Frequency Standard works. Next stage will be to build an enclosure and power supply, I may also add a couple of buffers and maybe a divider to get a 1hz pulse as well.